It takes a special kind of operation to be a successful distillery. Or, in the case of Leslie Hinchman, it takes special ops. Hinchman, who served with the Army’s special ops forces, is the CEO and president of Black Patch Distillery. The Black Patch recognizes those who have served – Special Ops uniforms do not display rank or personal identifiers, only two patches: the American flag and a black patch, which, on its underside provides key identification. In 2008, after being severely injured in a night raid, Hinchman’s black patch was his sole means of identification. 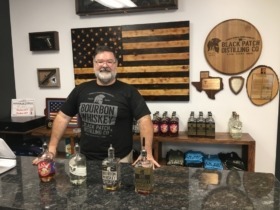 Black Patch Distillery is a family-owned business endeavor: Clayton’s wife, Leslie, is company president; his sister, Kimberly Mendez is the general manager; and Clayton’s stepfather, Gary Cooper is the master distiller. Cooper developed a fascination for the distilling process during his days in Houston, Texas, working as a polymer chemist. First, he began with brewing beer, then went on to perfect the art of distilling spirits. Black Patch has four spirits on the market. There’s also the 100 percent blue agave, which is much smoother than your average Mexican tequila. However, the best seller is Heat, a cinnamon-infused whiskey. 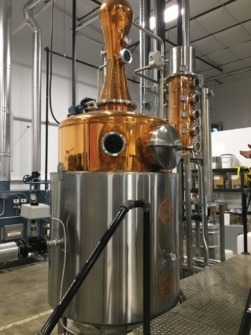 After perfecting his recipe for cinnamon candy, Cooper developed a process where the candy easily dissolves into the whiskey, providing a clear and spicy finish. Although distribution beyond the distillery is still somewhat limited, both the bourbon and blue agave are carried in ABC stores. The Black Patch logo design is significant. A warfighter helmet represents hardworking people who help shape the community—such as the military and first responders. Spears cross in the front to signify the fight against new challenges and obstacles. At the bottom, is “08”, the year Hinchman lost his leg in combat. The slogan, “Earn Every Drop,” is a testament to Cooper’s hard work.